PLYMOUTH’S Emily Bee has moved to the top of the UK under-17 80m hurdles rankings with a stunning performance at the South West Schools’ Championships at Exeter on Saturday. Having broken the championship record in the heats with an 11.27 second run, Plymouth High School’s Bee then ran a superb time of 11.05 seconds to take victory ahead of her club and Devon team-mate Sammie Harris. Bee’s time was not only the fastest in the UK this year, but also puts her fifth on the all-time list. She is also top of this year’s UK heptathlon rankings. Harris, who has a PB of 11.17 seconds, clocked a season’s best time of 11.45 on Saturday, which puts her in the UK’s top eight. Both athletes will now be focusing on the English Schools’ Track & Field Championships in Birmingham next month, however, before that there is the South West Schools’ Combined Events Championships next weekend. 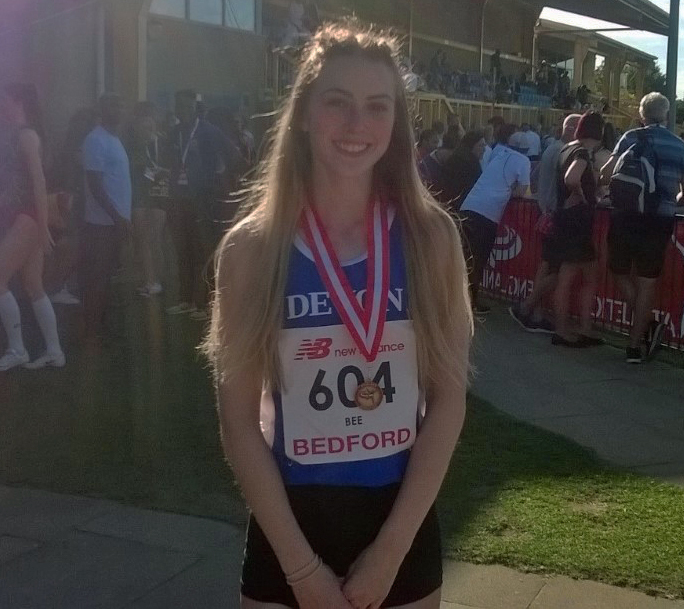 A number of other local athletes will also be eyeing the English Schools’ Championships in Birmingham after impressive displays at Exeter on Saturday. Erme Valley Harriers’ Ella Isaias won the junior girls’ high jump with an impressive leap of 1.61m. That was over the English Schools’ standard mark and just one centimetre off her PB. The Devonport High School pupil is currently ranked 11th in the UK in that event in her age category. Tavistock and Mount Kelly athlete Ben Pitts moved up to 10th in the UK under-15 boys’ long jump rankings after an impressive leap of 6.13m to take silver in the junior boys’ event on Saturday. The English Schools’ entry standard is 5.80m, with the national standard 5.95m. There was also a PB for Pitts’ Tavistock and Mount Kelly team-mate Jamie Bulbring. She ran a speedy 12.59 seconds to take silver in the junior girls’ 100m. That time puts her in the UK’s top 20. City of Plymouth’s Lili Fern also ran a PB of 12.82 seconds to take bronze. Tavistock and Ivybridge Community College’s Edward Fileman was another athlete to claim a medal and achieve an English standard performance when he threw 52.57m to win the intermediate boys’ hammer. Lois Fileman won the senior girls’ hammer with a PB of 40.36m, while Plympton School’s Kayleigh Weston set a new PB of 42.54m to take bronze in the intermediate girls’ hammer. Plymouth’s Molly Mather claimed victory in the senior girls’ 400m hurdles. She clocked a PB time of 65.38 seconds, which puts her 21st in the UK rankings. City of Plymouth’s Noah Jones secured victory in the junior boys’ pole vault with 2.85m. 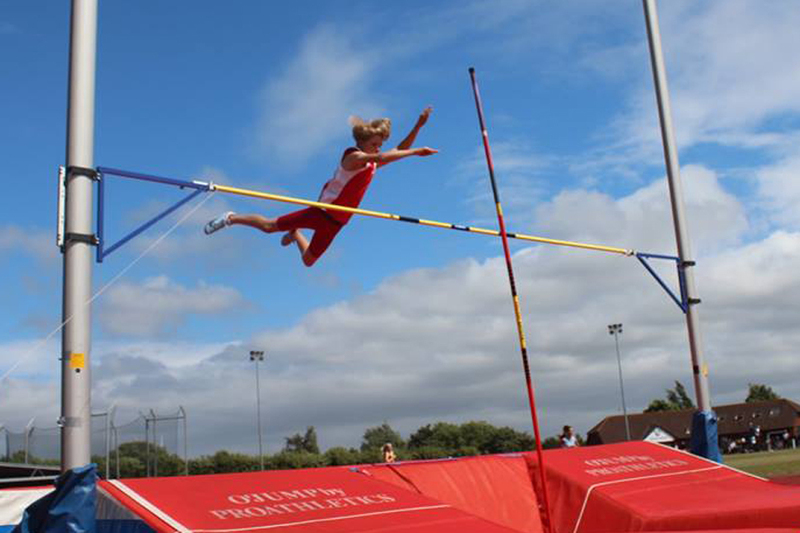 The Ivybridge Community College pupil thought he was going to achieve a new PB when he cleared a height of 2.95m, only for the wind to blow his pole back on to the bar. He is only in his first year at junior boys’ level, so will have another chance of going to the English Schools’ Championship next year. Mount Kelly’s Oliver Smart has been selected to represent Devon in the intermediate boys’ 1,500m in Birmingham after setting a new PB of 4:08.73 to claim second place in the South West Championships. It is his first year at the higher age group. There were also silver medals for Tavistock’s Harry Tomlin and Emma Ryder. Tomlin took second place in the junior boys’ javelin with a throw of 39.82m, while Notre Dame’s Ryder claimed silver in the senior girls’ 800m in 2:19.75. Also making the podium at Exeter was City of Plymouth and Lipson Academy’s Danny Filewod, who took bronze in the intermediate boys’ 400m hurdles with a PB time of 62.70m. Full results from the South West Schools’ Championships can be found HERE.